This book is somewhat prophetic as even today, seed companies are denying impoverished nations the ability to sustain their people without annually buying more seeds. 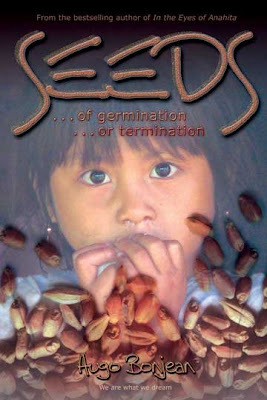 You see, seeds sold to many countries, impoverished and otherwise, are modified to not reproduce if you were to try to germinate the second crop. Perhaps you have heard of Monsanto they are a major power in genetically modified organisms - Some would conclude that GMO's are a good thing enhancing many qualities of food products in particular, but much research needs to be done as the consequences of tampering with nature could (and usually does) have catastrophic consequences that would threaten not only our environment, but our health as well. In Bonjean's story, "Nayla, a top scientist and respected board member of the mighty Carsanto Corporation becomes the country's most wanted fugitive when she impulsively steals the company's only germinator seeds to protect the planet and her daughter's future." Seeds is a great story, a relevant read. I encourage you to check it out for yourself.